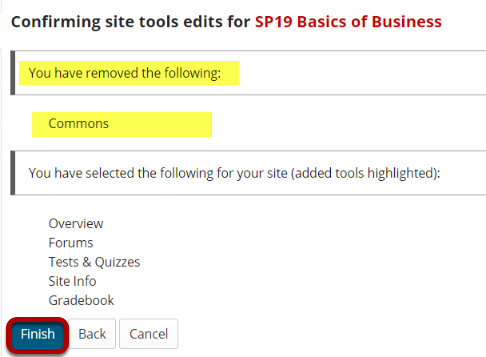 Sakai Community DocumentationSakai 19 User Guide (English) Site InfoHow do I remove a tool from my site? 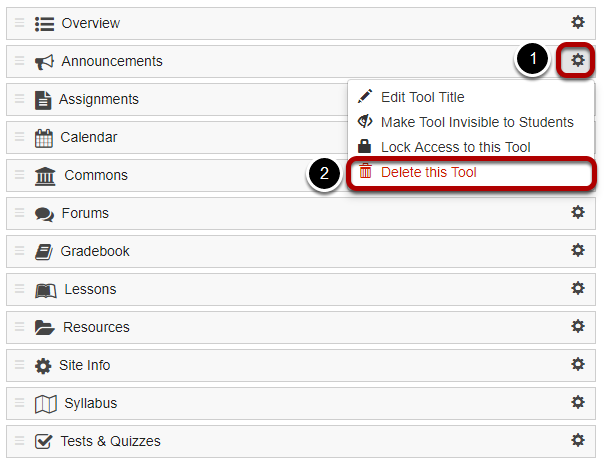 There are two locations in Site Info where you can remove tools from your site: Manage Tools and Tool Order. Remove a tool using Manage Tools. Uncheck the box next to the tool or tools to be removed. 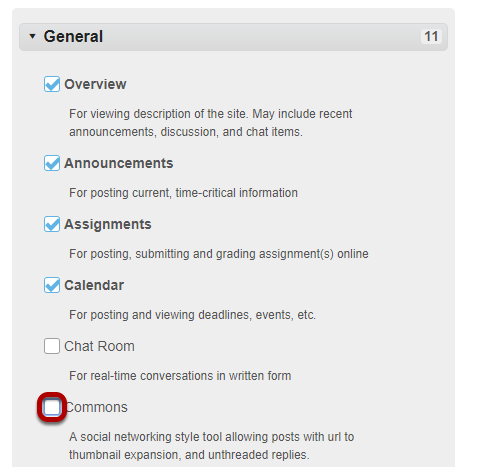 OR click the X icon to the right of a tool in the Selected tools list. Alternatively, you can use the Selected tools list to remove tools. Click the X icon (Remove) to the right of a tool to remove it. Once you have deselected the tools, scroll down and click Continue. Tools to be removed will be listed at the top of the screen. 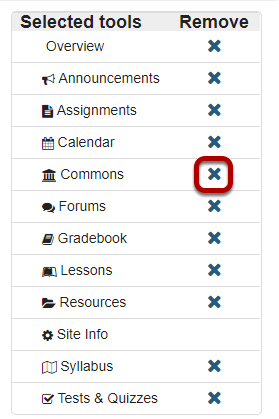 Tools you have selected to keep in your site will be listed below them. Click Finish to confirm that these are the tools you want. Remove a tool using Tool Order. Select to delete the tool. To the right of a tool to remove, click the cog icon. From the drop-down menu, select Delete this tool. You'll be prompted to confirm that you want to remove the tool from the site. Click OK if you are sure you want to remove it. Prev: How do I add LaTeX language to my course site? Next: How do I hide or show items in the Tool Menu?